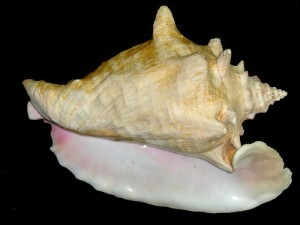 The queen conch (Strombus gigas) is an edible gastropod that is recognizable by its large pinkish shell. Queen conchs are found near Florida, southern Mexico, the Caribbean region, Venezuela, and Brazil. Conchs are harvested by hand or with simple tools. Conch meat is popular for salads, chowders, and other dishes. The shells are used by artists or marketed as collectibles.